SKU: Dart 32AJ20E 32 oz. 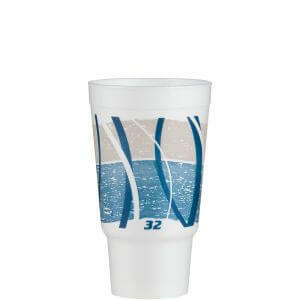 Customizable Impulse Foam Cup - Fits Cupholder - 400/Case. Categories: DART, FOAM CUPS / LIDS, FOAM CUPS / LIDS-1. Our line of stock printed foam is sure to increase impulse sales in your business! The updated designs and colors were developed to fit comfortably in any environment where hot or cold food or beverages are served”in convenience stores, cafeterias, coffee shops, at special events, and more. Most Dart stock printed cups and containers are color coded to make it easier for customers and employees to ensure the correct drink size is selected. And, with stock prints, you benefit from low minimum order requirements and quick turnaround times, as well as a cost savings when compared to custom printed products.